What is Manichaeism and who is a Bodhisattva? Like most people these days, I am looking for the answers to these or other questions on Wikipedia, undoubtedly one of the most frequented Web sites of our time. But unlike most of its users, I first have to activate my browser's proxy server before the world's accumulated knowledge will appear on my computer screen. That is because I currently live in China, a country that heavily controls which Web sites its inhabitants can access, and which they cannot. Unfortunately, Wikipedia belongs to a long list of blocked sites in China, and some of its contents remain miraculously hidden even when using a proxy server. Wikipedia could be the most prominent victim of Chinese Internet censorship. Most foreign news organizations' Web sites are accessible, however, with the BBC Web site being a notable exception. Most Chinese users will read their news on homegrown Web sites anyway, making Chinese Web portals more and more popular. QQ.com was recently ranked as the fifth most trafficked site in the world, and Sina.com followed closely behind at seventh place. The enormous task of controlling the multitude of electronic information circling around the globe every day lies firmly in the hands of China's own Internet police, which reportedly employs as many as 50,000 state agents. They frequently erase critical comments on popular bulletin boards and occasionally even arrest people who publish un-tolerated opinions online. The Great Firewall of China (known as the Golden Shield Project on the mainland) helps the government to block Web sites by preventing IP addresses from being routed through, and through selective DNS poisoning when particular sites are requested. Ironically, some of the world's major Internet companies, normally ardent supporters of free speech, support this system of censorship. The American company Cisco Systems sold more than 200 routers to the Chinese government in the summer of 2005, thereby greatly enhancing the government's technological censoring ability. The Chinese version of the popular Skype software, a pioneer in the field of Internet telephony, is configured to censor sensitive words in text chats automatically without informing the user. The corporate heavyweight Microsoft censors the content of its blog service MSN Spaces. They explicitly censored searches and blog titles to avoid sensitive political topics and even deleted or blocked whole blogs. 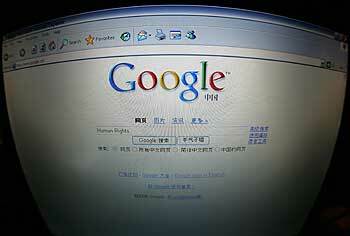 Even Google cooperated with the Chinese authorities, agreeing to block Web sites that are illegal in China. Its Chinese search engine under www.google.cn is heavily censored, though not as much as the government-sponsored Baidu search engine. Yahoo cooperated with the Chinese censors to the degree of releasing the identity of private users to the Chinese authorities. Four prominent Chinese government critics, Shi Tao, Li Zhi, Jiang Lijun, and Wang Xiaoning, were subsequently imprisoned and received heavy sentences. Human Rights Watch, a renowned nongovernmental organization, recently strongly criticized all companies that cooperate with the Chinese authorities in terms of censorship, urging them "to use all legal means to resist demands for censorship of searches, blogs, and Web addresses. Companies should only comply with such demands if they are made via legally binding procedures that can be documented and after the company has exhausted all reasonable legal means to resist them." HRW also called on the United States, the European Union, and other jurisdictions to prohibit companies from storing private user data on Chinese Web servers. Rebecca MacKinnon, a consultant to HRW, argued, "Western Internet companies are complicit in actively censoring political material without telling users what's happening and why … We believe that companies could act more ethically and still operate in China. It is time for Internet companies to decide whether they want to be part of the problem or part of the solution." The blocking of certain Web sites is, however, not the only way for the Chinese government to restrict access to potentially sensitive information. Very often, some unwanted information is simply erased, and sometimes even replaced with the official position of the Chinese government. Since the country's Internet police could never monitor the entire Chinese Web all by themselves, Chinese leaders have been trying to mobilize the masses to help with this monumental task. An initiative named "Let the Winds of a Civilized Internet Blow" was launched through which many schools, colleges, and Web portals now police their online grounds themselves. College bulletin boards especially are thoroughly monitored, very often even by the college's own students, and almost certainly without the knowledge of their peers. These student monitors not only delete controversial comments, but also introduce politically correct themes for discussion. Bulletin boards in China are a main source for information, especially for the growing majority of people who do not have a lot of trust in the official press anymore. Recently, some universities have started to block off-campus users from contributing to their bulletin boards and now require students to log in with their real names. Some Chinese have found another medium to express their criticism, anger, and frustration. In recent times, there have been a growing number of amateur videos online that parody socialist Chinese movie classics. Their popularity has skyrocketed in a relatively short time. It seemed that many Chinese appreciated the opportunity to express their frustrations in a funny way. Now the Chinese government has released new regulations requiring all Internet video clips to be registered with the State Administration of Radio, Film, and Television, an organization charged with the censoring and licensing of movies and television shows. What's more, only specially authorized Web portals will be allowed to distribute the videos from now on. So what is the solution? Of course, it would be best if China would extend the privilege of censor-free Internet access to all of its citizens, and not only to the new Chinese students of Kean University. That American College's new branch in Zhejiang received the exclusive permission from the Chinese government to connect all their campus computers directly with their uncensored U.S. servers. All other Chinese Internet users interested in unrestricted access to all the knowledge the Web has to offer will have to continue using proxy servers or special software such as Anonymizer. That San Diego-based company recently started an Anti-Censorship operation, not funded by the American government, that allows Chinese Internet users to access blocked sites using its especially developed software. Every week or so, the software will be available for download under a different Internet address (to avoid blocking by the Chinese censors) and users, once registered, will receive weekly updates by e-mail.